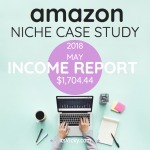 92% Revenue increase in ad income how does that sound? That’s the desktop ad increase for my Ezoic test site, and that’s after 2 months of being a part of their ad program. A high of $53.54 EPMV (earnings per thousand visitors) is not too shabby either, but we are getting ahead of ourselves. Let’s start from the beginning. 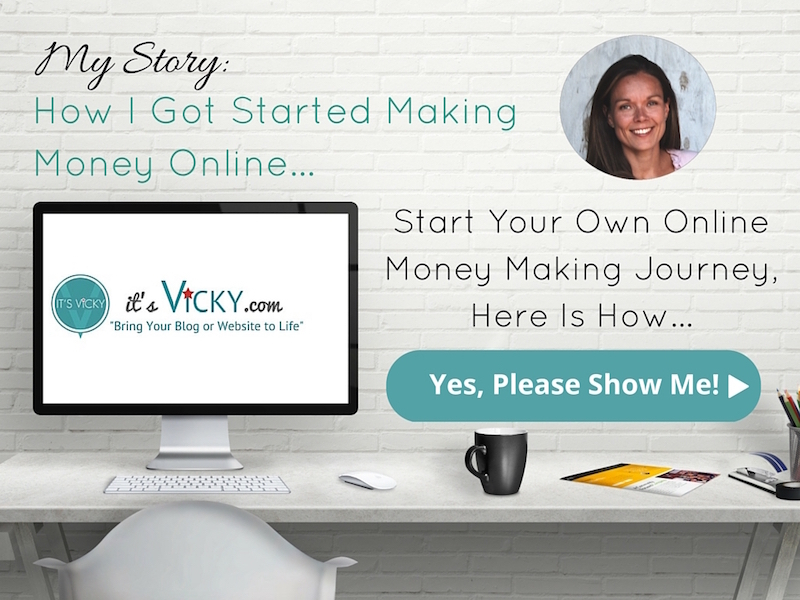 One day I was talking to one of my online friends about increasing revenue on ads showing on my site. He said that Ezoic, an automatic ad tester software, had really increased revenue on one of his sites. With an average revenue increase of 115%, it sure sounded interesting. I know not the best thing to think, you can never make too much money and maximize your earnings on what you already do is a great way to increase your income. I mean an average increase of 115% could really bump up my monthly income for that site. Could Ezoic be the software to help me maximize earnings on this one site? 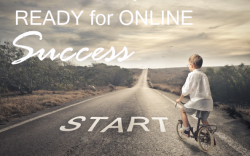 The site is monetized with a combination of affiliate products and Google Adsense Ads. It’s a tech related site and it brought in around $8,500 in Google ads during 2016. This was after having some real issues in the beginning of the year where AdSense dropped to almost nothing due to major downtime of the site. I’m curious to what the REAL potential of this site is? 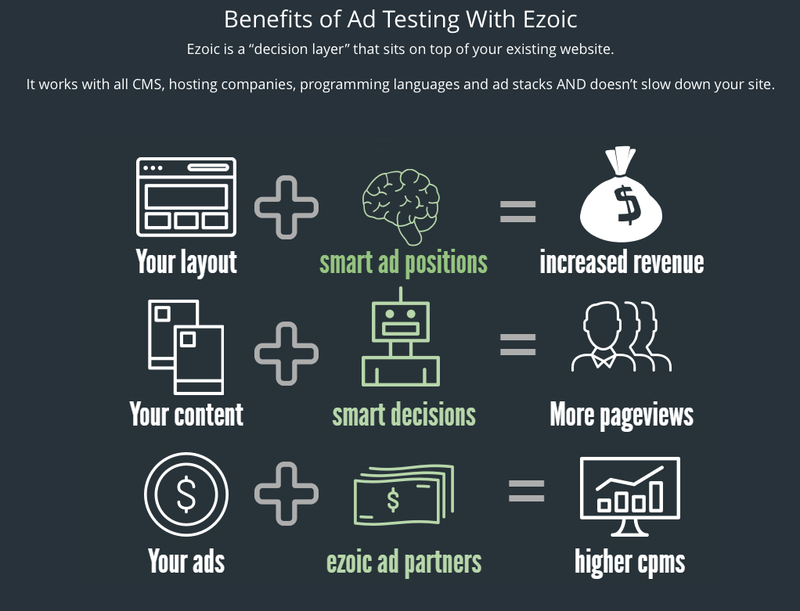 What’re the maximum earnings after putting it through the Ezoic ad tester? Will it increase 115% in ad revenue? We know that it’s up 92% for desktop after 2 months, but what will it be after 6 or 12 months? $8,500 in Adsense income 2016, what will this site earn during 2017 with Ezoic installed? 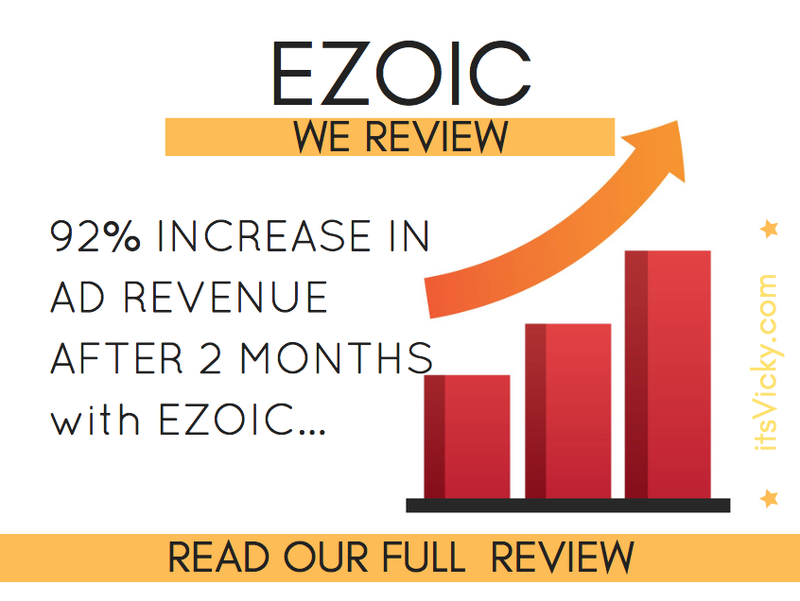 Before I give you some more details about the site and more in-depth results, let’s take a closer look at Ezoic, what it is and what it offers. They help you find the absolute best combination to maximize earnings. With these different variables, there are thousands of combinations and it would take you probably years to figure out the “ultimate” combination for your site, Ezoic does this automatically. Ezoic is a Google AdSense certified publishing partner but that’s not the only ad program they work with. By signing up with Ezoic it allows you to get access to all their other ad partners as well. More competition for your ad space means higher payouts. 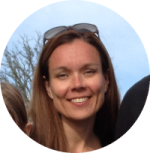 How Can Ezoic Help You? If you run ads on your site, ads like Google Adsense, Media.net or other ads they can help you find the best ad placements, with the best ad size, colors, and designs, plain and simple the best ad combination. They do that by placing an unlimited amount of ad codes on your posts and pages BUT they only show the allowed number of ads. So if I have 12 ad codes placed on my site, now Ezoic test different combinations by displaying the allowed number of ads. You can control that so if you only want to show 3 ads, even though 5 is allowed, you can adjust the settings to show 3 ads. Over time they figure out the “ultimate” and best combination for the site. Saves a ton of time and help maximize earnings!! There might be better add options that work better with your site. Not everybody goes with a big publisher like Adsense. With Ezoic you do not only access Adsense ads but also their other ad partners, via their ad exchange program AdX ads, allowing them to bid against each other, which drives up the ad price. 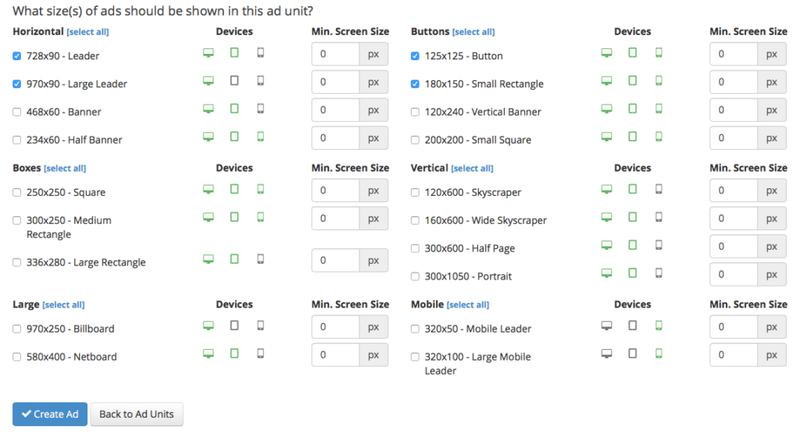 Customize specific ads for mobile, tablet and desktop easily and test what works best where. Do you feel that you have maximized ad revenue on your site? Have you tested different ad positions, different colors, and combinations, to find the most effective one? 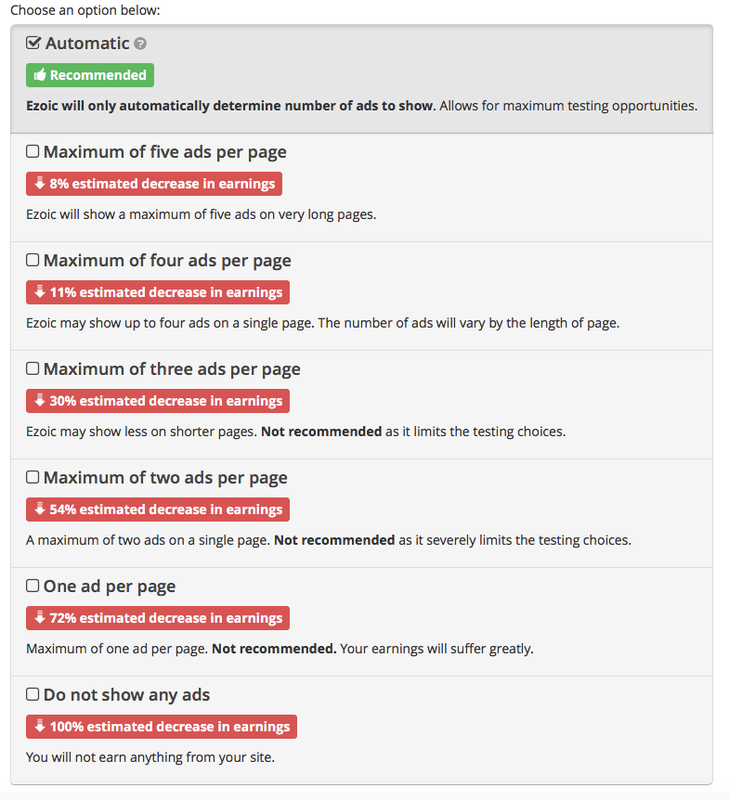 If you feel that you have tested different ad combinations, there are probably a ton left to test. Make it easy for yourself and let a software like Ezoic do it for you. Ezoic is very easy to use after you install it and add your ads, the system will go to work and find the best ad combinations. At that point, you really don’t have to do anything other than checking your stats ones in a while. 6. Great Company and Customer Support! The people that I’ve been in contact with, Jenny and Charlotte have been amazing, very helpful and knowledgeable and willing to help. They made me trust not only them but Ezoic. 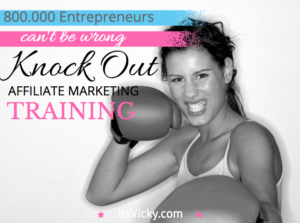 The results – who doesn’t want to earn maximum revenue on something that they do already. The increase I’ve seen so far has been far better than expected and I’m curious to see what the site will do in 6 to 12 months. In return, they do place a small ad at the bottom of your site. If you don’t want the ad you can pay to keep using the system. 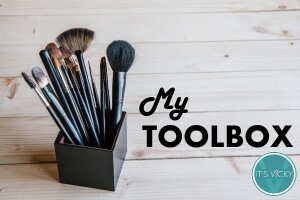 Thoughts I had Before I Started Using Ezoic? When trying something new, you are always concerned if it will work. Will it increase MY earnings? All the questions I had before getting starting and during the setup process were very well answered. I already mentioned Jenny and Charlotte, but they were very helpful and answered every single question and concern I had. So after deciding to go ahead and try Ezoic (which by the way I’m very happy I did) my thought process was that the worst thing that can happen is that I’m not really increasing my ad earnings and go back to Adsense full time. I was willing to give it some time, at least a few months to see if it could improve ad earnings for the site. On the flip side, the best thing that can happen is that I use Ezoic to figure out the best ad placements for the site so that I can maximize earnings and make more money on what I’m already doing. I hate to leave money on the table, when not necessary. The results after the first week were not impressive. I was using Google Adsense 50% and Ezoic 50%. Seeing just a few bucks in the Ezoic account was a little discouraging but I knew I had to give it some time. The thing was, that it seemed like my Google Adsense earnings dropped as well. Not sure why that was, coincidence possible. Here are the Google Adsense Results for this Site before starting to use Ezoic, so that we can compare along the way. The goal is to “beat” the month of October and $1,325.38. 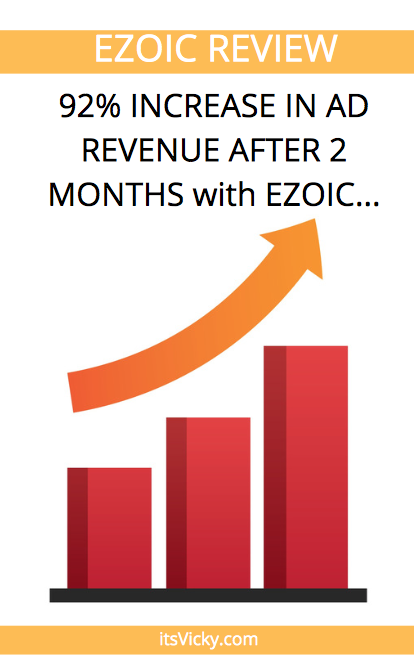 The drop in revenue with Google Adsense was another reason to WHY I wanted to give Ezoic a try. This is around the holidays so there are all kinds of factors playing a role here, but something had to be done to stop the downhill trend. I started using Ezoic a couple of days into February, so the result from February comes from about 25 days of earnings. What really surprised me here was the big gap between the low and high EPMV, you can tell that the Ezoic system is really trying different models and versions of the ads. Some successful and some not so much. Seeing the $45.79 EPMV made me excited though, gives me good hope for the future. The tablet and mobile I left at 50 / 50 still. I see great progress for desktop but mobile is still adjusting it seems like. The second month I also saw some ad partners bidding on ad space, probably increasing the ad price some. The average EPMV took a good jump, that’s exciting. I’m happy about the increase with Ezoic but also directly with Google Adsense. We didn’t beat our goal of $1,325.38 yet, but a good month only two months in using Ezoic. I know the site has the potential to earn a lot more with ads, so I’m excited to see what next month will bring. Two months in and we are now in April, I will give you all an update in the beginning of next month. Is Ezoic Worth a Try? From what I’ve seen this far, absolutely yes. If you can be patient and take a drop in the first month or so, the results can really benefit you long term. Here’s the improvement on my site so far. What Can You Expect After Signing Up with Ezoic? If you are curious to try out Ezoic, let me show you what you can expect after you sign up with them. 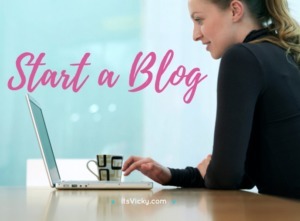 They have a step by step guide that explains it all in detail but this is what you need to do to get started with Ezoic ad testing. 1.Integrate your site with the Ezoic system. This can be done either by Cloudflare or pointing your name server to Ezoic. I wanted to use the second option, but I was a little hesitant to point my site to them. Support really cleared all my doubts and I went ahead and did it. It was easy, I had no downtime and the site has been running really smoothly. I know I can change back my nameservers at any time, I’m still in 100% control. 2. Wrap the ads you have on your site already. To be able to test the old ads with the new ones you have to wrap the old ad code. This is shown step by step and easily done. 3. Create new ad placements. I’ll show you below how to do this, using the “ad tester” app. 4. Sign up for the Google Double Click Ad Exchange program. This is optional but if you want to maximize earnings, I would definitely go ahead and sign up. This also allows you to show 5 Google Ads instead of 3 on each page. 5. Turn on your ads. I chose to go 50/50 when I started but that’s up to you. 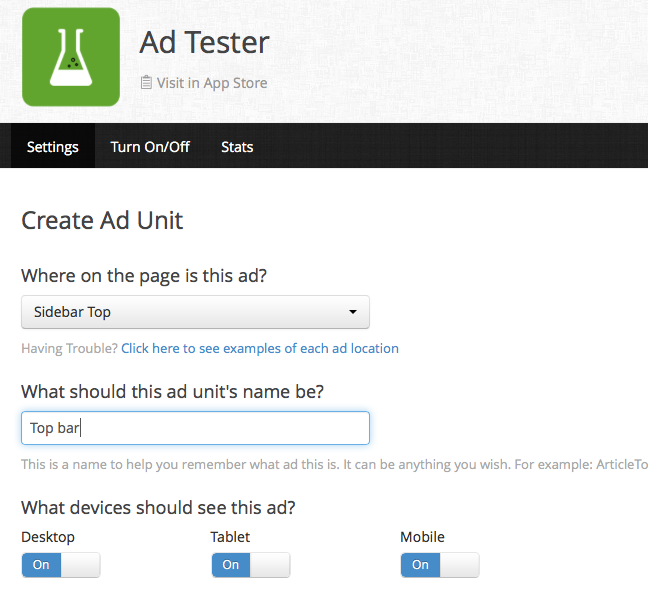 It’s fast and easy to create new ads with the “Ad tester” app. To create your ad you fill out the below form. When your ad is created you copy and paste the code on your site. AdColors help you test different color combinations. MaxAds/Page helps you set the wanted adds that you want to display on your site. CloudFlare protects and improves performance on your website. 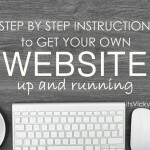 It allows for your site to run smoothly. The Mediation app allows you to link with add partners that you are already working with. They can then compete for ad space, which will up the price for ads on your site. Ezoic work with all these so you don’t have to sign up with accounts if you don’t have one, but the more competition the better for you. 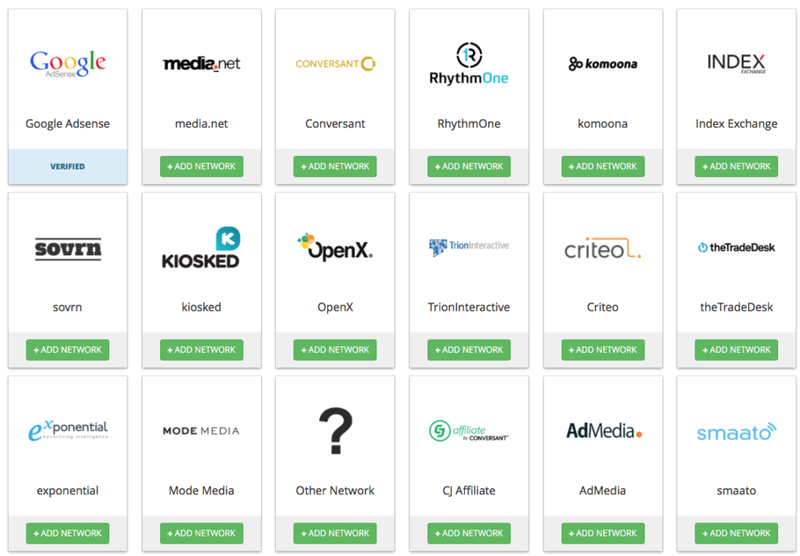 Here are some of the ad networks that Ezoic work with. 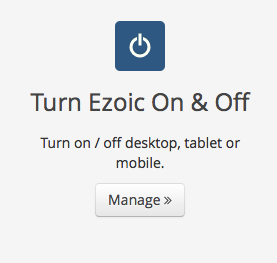 Q: What if I want to turn off Ezoic? A: This is very easy to control, you can turn off Ezoic completely or change the % of how often you want the Ezoic ads to be displayed. Q: How is the reporting? A: I must say that I love the dashboard. It gives a clear overview of the site, it only takes seconds to see the progress. The information is delivered in an aesthetically pleasant way, it’s clear and easy to read. On your dashboard, you will see apps installed, performance, estimated earnings, and visitors. Q: Can I control the ads that are shown? 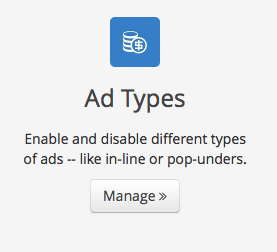 A: Yes, under Ad Types you can set to show inline ads or not. Also if you want content PG friendly. Q: Is it hard to get accepted into Ezoic? A: No, unlike many other ad networks Ezoic approve most sites. There’s a lot more to test and try out with Ezoic, going forward I might give the layout tester ago. Let me know what you think. Are you ready to give Ezoic a try? You can sign up with Ezoic right here, for free! Very interesting software and running an “info site” monetised by means of ads rather than affiliate links is very interesting, been on my mind for a while. Keep us updated on how you are doing with that and, if possible states related to your traffic for this case study site. No of visitors, ave pages viewed and time spent on site does give us all a better indication of your site’s performance in relation to ads (did you get more $$ with less traffic? or more because ave no of page views (and thus ad impressions ) went up? Thank you for your feedback, will make sure I include your wanted numbers when I update the post. The increase came mainly from better EPMV. What were your results from April? Are you still using it? Hi, Yes I am still using it, I will put together an update for sure. Hi, the site I used was not hosted at WA, sorry if you are having issues with that.